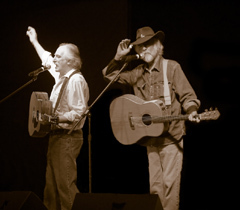 Recognized as one of the most successful folk rock duos of the 1970s, Brewer & Shipley have remained true to their original form for an astonishing five decades. Although best known for their Top 10 signature song, “One Toke Over The Line,” which permanently etched their names in rock history by becoming an anthem of the '70s counterculture, Michael Brewer and Tom Shipley were by no means a one trick pony. In all, the duo landed three singles on the Billboard charts and had the pleasure of working with such notables as Mike Bloomfield, Leon Russell, Jimmy Messina and the late Jerry Garcia. Constantly touring, Brewer & Shipley could be found performing in such notable venues as Carnegie Hall, The Bottom Line, The Troubadour, The Roxy, Keil Opera House and Arrowhead Stadium. Because of their broad appeal, they became a favored support act for major tours, sharing the stage with a diverse list of artists, including Elton John, The Eagles, Bruce Springsteen, Billy Joel, Bonnie Raitt, Electric Light Orchestra, Jethro Tull, Humble Pie, Ted Nugent and Black Sabbath among others. In 1979 after more than a decade of writing, traveling, and performing, Brewer and Shipley parted company to pursue personal interests. Michael Brewer continued to make music, recording a solo album for Full Moon Records entitled "Beauty Lies". This release featured guest artists such as Linda Ronstadt and J.D. Souther, and was produced by longtime friend Dan Fogelberg. Tom Shipley began working as a television producer/director, eventually forming his own production company (Tarkio Communications). He later founded the Oral History of The Ozarks Project, a not-profit organization producing documentaries about life in the Missouri Ozarks. In 1986, at the request of KCFX (Kansas City) the duo reunited for a concert to celebrate the station's first birthday. Unsure of what to expect having been out of the public eye for so long, the duo was overwhelmed as they walked on stage to more than 10,000 cheering fans welcoming their return. Having come full circle from their days as staff songwriters living in Los Angeles, Brewer & Shipley began writing together again. Brewer & Shipley continue to tour and record regularly, having released two albums of original material since reuniting - “Shanghai” and “Heartland.” Regarding Brewer & Shipley, Ron Sylvester (The Branson Note) wrote, "An actual group from the '70s still capable of making vital music … For a duo best remembered as '70s folkies, this is a solid blast into the present … undeniable proof these guys can still make evocative music."